If you Google “Gir Forest National Park” you’ll probably see the above image in the upper-right of the search results. That’s because Gir, located in India just off the Arabian Sea (here’s a map), is the home of the Asiatic lion, an endangered species. 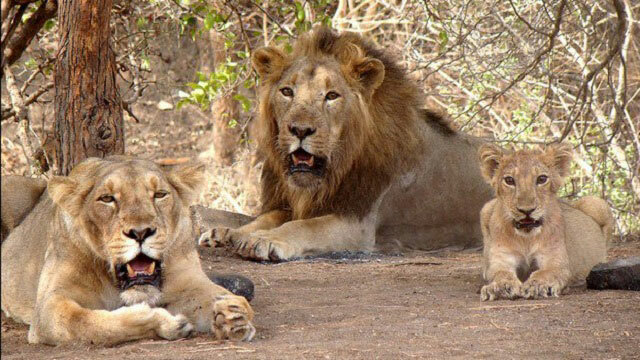 There are only about 500 or so Asiatic lions left in the world and all of them, except for those who live in zoos or the like, live at Gir Forest National Park. As one would expect, people are restricted from visiting the area (both to protect the lions from the people and to protect people from the lions), but the area isn’t entirely unpopulated. There’s a Hindu temple called Kankai situated in toward the middle of the preserve. 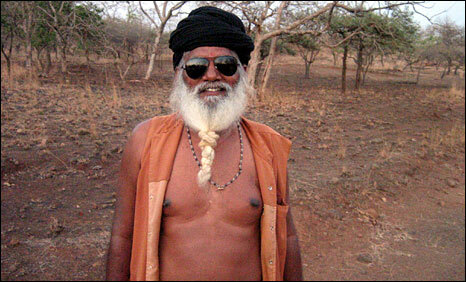 As of 2014, Kankai had one resident, a full-time caretaker named Guru Bharatdas Darshandas. Darshandas, pictured above, is isolated. As the BBC reported, “in the temple, there is no electricity, barring a few flickering bulbs powered by an ailing solar panel. There is no TV, no phone. His only link to the world, Mr Darshandas tells us, is through Hindi news on BBC shortwave radio.” His roommates are snakes and mosquitos; his neighbors are the aforementioned lions. As of 2009, there was a cook, guard, and priest who also regularly come to the temple, but none live there full-time. The nearest village is a two hour drive away. And this is a problem — not for Darshandas, but for the Election Commission of India. So the ballot box has to come to Darshandas — even though there are many more lions in the area than voters, by about a 500 to 1 ratio. So, Darshandas gets to vote. But as he told the BBC, it comes with a downside: as he’s the only person to use the ballot machine in his area, everyone knows who he supported. Bonus Fact: With the exception of the Asiatic lions in Gir Forest National Park, the only place you’ll find lions in the wild is in Africa. But that wasn’t always the case. There are fossil records of lions in Europe, likely dating back about 3,000 years. The European lions, per Wikipedia, lived “in ancient Greece, central Germany, Turkey, Georgia, Azerbaijan, Armenia, Iran, southern Russia, coastal Saudi Arabia” as well as parts of Asia and India. They were likely driven to extinction by humans. From the Archives: Swing Vote: When one vote really, really mattered. Really. Take the Quiz: Pick the animated Disney characters without clicking on lions, tigers, or bears. Related: A print of a sleeping Asiatic lion from National Geographic.